This week for my review, I took a look at the list of "50 people and hashtags you MUST check out on Twitter" from Matt Miller's blog, Ditch that textbook. I chose three of each to focus on either because of their creativity, possible classroom application, and relevance to my content area. If you are interested in following these people and learning more about the hashtag that I chose, please keep reading. ​As described by Matt Miller, "Dave’s enthusiasm and passion are contagious. He wrote the New York Times bestseller Teach Like a PIRATE and does keynote presentations that will knock your socks off. His tweets will do the same!" 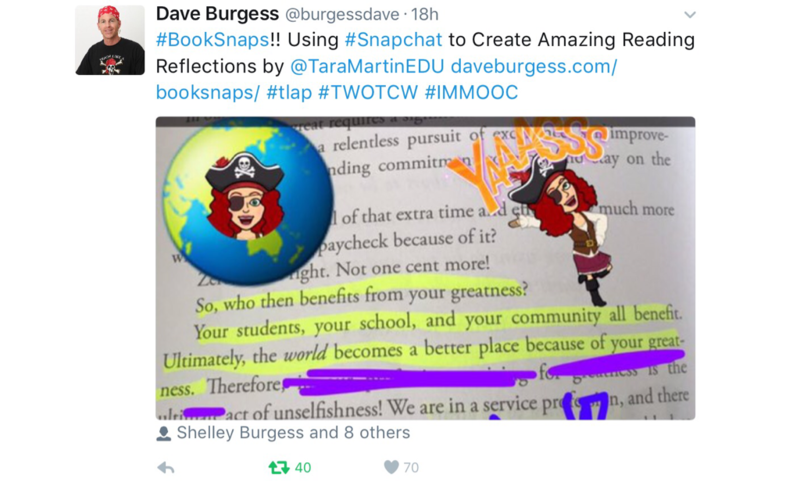 One of my favorite tweets that I stumbled upon provided an interesting idea about using Snapchat to create reading reflections. Teachers are using this idea to encourage student interaction with the texts that they are reading. Click here for a video about how to create your own #BookSnaps. ​"Todd has written 40 books on leadership, teaching and motivation. He shares great nuggets of wisdom on a regular basis." His Twitter provides a large amount of educational leadership resources specifically for principles and school leadership. 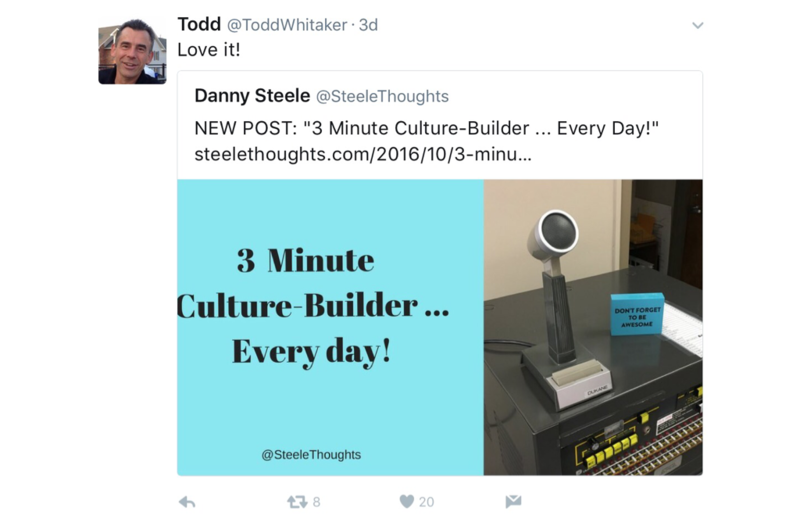 One tweet that he retweeted contained a blog post about "3 Minute Culture-Builders." This is about incorporating a small phrase or culture-builder into your morning announcements. Even something as simple as "Good Morning! It's a great day to be a Mustang!" can help to shape and encourage your school culture and begin the day positively. ​"Mari’s interests include Google tools in the classroom, digital BreakoutEDU and blended learning. She regularly shares useful, thought-provoking stuff on her blog." 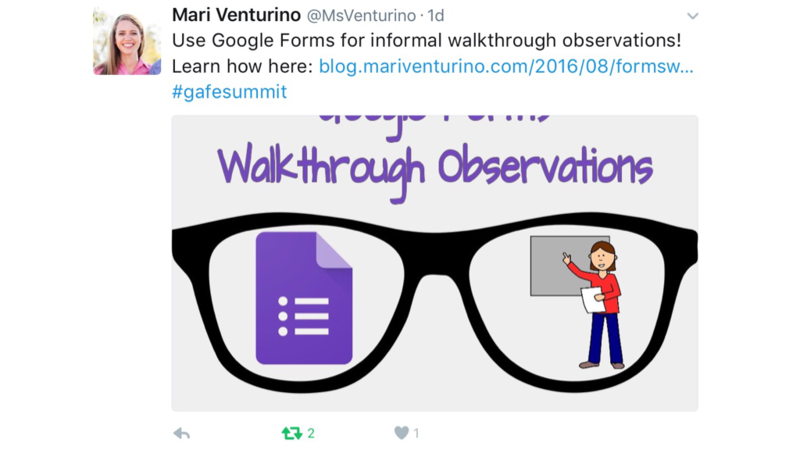 On her twitter, I found this great resource that contains a super simple Google Form for informal walkthrough observations. She suggested that teachers all have a QR code by the door for the observer to scan that then takes them to the appropriate google form. I really love this idea because it simplified the observation process and allows teachers to receive immediate feedback. According to their website, The mission of EduMatch is to connect educators around the world, along similar topics of interest. I explored the hashtag above and found three resources that I think would be helpful to use in the classroom. 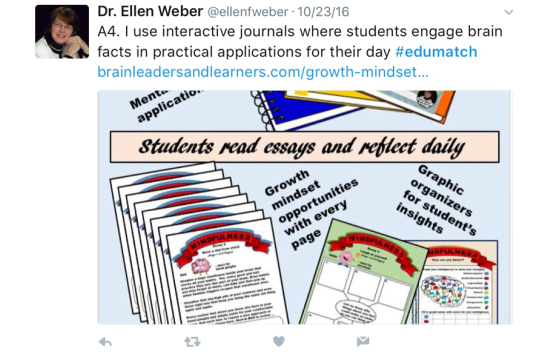 ​The first resource, from @ellenfweber, suggested using interactive journals in the classroom. This could include reading articles and responding or applying what they know of the writing process to the way that they solve things in path. #edumatch has forum type discussions where teachers can share information and resources with one another. Other teachers had also interacted with this post and provided supplemental material if the teacher needs help with finding just how to implement this idea. One one of the discussion posts about helping struggling readers, @StoryShares suggested a resource that I had never heard of: Storyshares.org. Story Shares is a non-profit organization devoted to inspiring reading practice and improving literacy skills. They have an online library full of "Relevant Reads," which are books that are both compelling and approachable for struggling teen and young adult readers. There are many different reading levels and the books are arranged by category so they are easily accessible for all students to find something that interests them. The final resource that I thought was helpful was shared by @BevLadd. She posted an article to #edumatch titled 4 Ways to Encourage a Growth Mindset in the Classroom, which can be read here. This article contains specific numbered suggestions for how to accomplish a growth mindset and it makes the process attainable, even for teachers.